Li & Fung Limited (LFL), the Hong Kong-headquartered MNC, is recognized as the world's leader in consumer goods design, development, sourcing and distribution. It manages the supply chain for retailers and brands worldwide from about 240 offices and distribution centers in more than 40 economies spanning across the Americas, Europe, Africa and Asia. Through its three interconnected business networks -- trading, logistics and onshore, LFL offers spectrum of services that covers the entire end-to-end supply chain. In 2010, LFL announced strong core operating profit growth of 42% to US$725m, reflecting solid organic growth and significant margin expansion from onshore businesses of the United States and Europe. It also announced the details of its new Three-Year Plan for 2011-2013, which include reaching core operating profit of US$1.5bn by 2013. LFL has paid a final dividend of 52 HK cents per share on 18 May (ex-date: 6 May). It also implemented a split of 1-into-2 to subdivide par value of 1.25 HK cents (from 2.5 cents) each in order to improve market circulation of the shares. During the FY10 press release in March, LFL acknowledged that while the Three-Year Plan targets are once again ambitious, it is confident to achieve them as the Group now covers the entire supply chain end-to-end and is well positioned to grow across these three distinct yet interconnected networks. In the wake of recent headwinds in the global equity markets coupled with shares overhang following ex-dividend and the subdivision of shares, LFL has been trending lower from HK$18.32 (3 Jun) to as low as HK$13.18 (14 Jul) before ending at HK$13.78 last Friday. 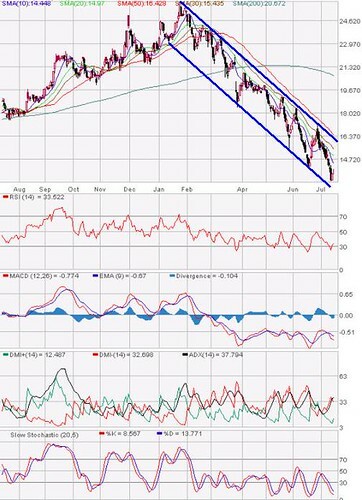 There could be further relief rally in the offing due to the recovery in share prices above the downtrend channel and upticks in the extremely oversold technical indicators. However, any rebound will be short-lived if the 10-d (HK$14.45) and 20-d (HK$14.97) SMAs are not violated. Further resistance zones are the downtrend line resistance at 30-d SMA (HK$15.43) and 50-d SMA (HK$16.43). 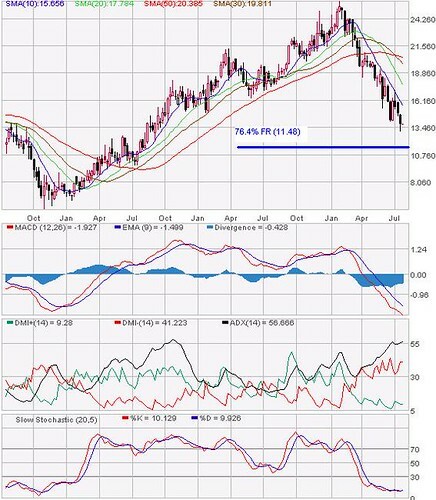 Immediate supports are 52-wk low of HK$13.12 and HK$11.48 (76.4% FR). Traders can accumulate for possible technical rebound amid its extremely oversold readings. Cut loss below HK$11.48.